Appalachian Outdoors gave me the opportunity to review one of their cool products, Vibram Fivefingers KSO Barefoot Shoes. The concept of these barefoot shoes has intrigued me for some time. A friend of mine had used them on a hike at Leslie Gulch, Oregon and loved them. Using your foot the way it was designed just seems better than having it shod with engineered unnatural supports. I took them camping and wore them the entire time. I hiked around on all kinds of terrain to really put them through their paces. I was delighted with their comfort and performance. 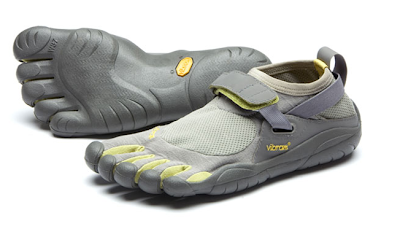 The Vibram rubber sole is perfect for natural flexibility and it also gives your feet the protection that you want. The nylon and mesh upper part are breathable and along with the closure strap help keep trail debris out. I also used them as water shoes while swimming with my kids in one mountain lake. They worked perfectly for that and dried quickly. Putting them on takes a little bit of effort, one toe at a time. Don't forget to use that little loop at the heel to help. The only disadvantage I found was that while hiking through vegetation, I would often get plant material stuck between my toes. Based on a couple weeks of testing these shoes out, I highly recommend them to other birders and hikers. I love these barefoot shoes so much that I will likely be wearing them at the Midwest Birding Symposium in Ohio. Maybe it will start a new trend among birders! We love to leave things in their natural state as much as possible right? Why not our feet?! Pop on over to www.AppOutdoors.com and order yourself some Vibram fivefingers barefoot shoes and check out all the other cool outdoor and camping gear they offer. Robert, my future son-in-law wears these or something like them. I am intrigued and have thought of getting a pair for myself. I like the idea of them but they do look a bit ridiculous and I can only imagine a whole convention of birders wearing them. LOL! If we didn't already stand out because of our funny hats and optics we certainly would with these on! @Kathie - Ha ha ha! They do look a bit ridiculous...kinda monkey like...but they are oh so comfy...and make you feel one with nature! I'd go barefoot if I didn't have such baby skin on my feet. Slivers and goat heads in my feet make me want to cry like a little kid. Hi Robert...hahaha...they are funny looking, but i am familiar with these almost barefoot footwear. A friend of mine is a runner and she loves her's..I can't imagine myself walking let alone running in them...I do go barefoot all summer where ever I can though!! I have to mention your last post on Kestrels !! I was so blessed this spring,...right in my front yard in the Weeping Willow tree branch that hangs over my driveway with a Kestrel family nesting in a cavity in the branch!! I was able to set just inside my garage door ..50ft from the tree, and watch over a two month period of time 7 babies leave the nest...of course I took photos too!! I did 3 posts in July called "I fell in love with the Kestrel family" if your interested!! Nice blog...thank's for joining mine!! The barefoot shoes! Haha these shoes are so intresting and odd, but everyone says it’s comfortable! My friend got hers and she loves them! Funny thing is she even comes in to work wearing them.Maybe we could exchange links with my site www.5fingervibramshoes.com! Anyway thanks for the informative post and I’m loving your site!